Dental Remedies: Perio Rub, SECURE Denture Adhesive, WOW Drops! • REJUV for Gums: REJUV for Gums is the only 100% herbal oral pain reliever and gum conditioner. REJUV for Gums is made with Cassia and Ficus Bengalensis helps heal gum tissue, and Sesame Oil base helps calm, nurture, and rejuvenate the gums and ease dry mouth conditions. Helps from receding gums, oral pain, swollen gums, and bleeding gums. REJUV for Gums helps eliminate bacteria from the oral cavity, leaving the mouth fresh and invigorated. REJUV can be used for all gingival conditions. Some people have even said that it helped tighten loose teeth. 1.7 oz. ORDER TODAY! Ingredients: Sesame Oil (Organic), Acacia Nilotica, Ficus Religiosa, Wild Himalayan Cherry, Cardamom Extract (Organic), Banyan Tree, Acacia Catechu, Lodh Tree, Indian Madder, Eagle Wood, Indian Gall-Nut, Indian Gooseberry, Gmelina Arborea, Long-Leaved Pine, Spikenard, Stone Flowers, Sandalwood, Woodfordia Fruticosa, Deodar, Licorice, Clove, Lotus Seed, Lemongrass Turmeric, Nutgrass, Nutmeg, Cinnamon, Camphor. ORAL CARE: REJUV for Gums, 1.7 oz. • Neem Tooth & Gum Oil: Neem Tooth & Gum Oil is a concentrated blend of Neem, adaptogens, and essential oils in beneficial Coconut Oil. Neem is treasured by Ayurvedic practitioners for its ability to support healthy skin and oral health. Neem Tooth & Gum Oil is cooling, calming and gently astringent with concentrated formula for instant needs. Made with Organic Coconut Oil, Co-Q10, powerful Essential Oils and Supercritical Extracts. 0.5 oz. ORDER TODAY! Ingredients: Cocos Nucifera (Virgin Coconut Oil)1, Mentha Piperita (Peppermint Oil), Citrus Medica Limonum (Lemon) Peel Oil, Eugenia Caryophyllata (Clove Bud Oil), Cinnamomum Zeylanicum (Cinnamon Bark Oil)1, Camphora (Camphor Oil), Menthol, Mentha Viridus (Spearmint Oil), Azadirachta Indica (Neem Oil)1, Rosemarinus Officianalis (Rosemary), Adaptogen Blend (Azadirachta Indica (Neem) Leaf, Ocimum Sanctum (Holy Basil), Withania Somnifera (Ashwagandha) Root, Tinospora Cordifolia Root), Co-Q10, Vitamin E.
ORAL CARE: Neem Tooth & Gum Oil, 0.5 oz. • PerioRub Topical Rub: Periorub for Periodontal Health is a natural gel that offers fast, effective, long-lasting relief from tooth and gum discomfort. Our propietary vegetarian formula contains soothing organic nd responsibly wildcrafted herbs plus essential oils. These ingredients work together to calm tooth and gum distress. 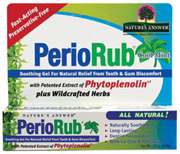 PerioRub also freshens breath while promoting healthy gum tissue. It is further enhanced with Phytoplenolin a Holistically Balanced patented herbal extract that has been shown in independent labatory studies to promote cell vitality. Use for the temporary relief of tooth and gum discomfort. May also be used as an abrasive-free toothpaste for sensitive teeth. Long-Lasting. Dentist Formulated. 0.5 oz. ORDER NOW! ORAL CARE: PerioRub Topical Rub, 0.5 oz. • Wow Drops Breath Freshener: ONE TINY DROP IS ALL IT TAKES! The most powerful breath freshener. Opens bronchial passages, alleviates bronchial cough. Protection against sore throats, colds and flu and energy booster. Great for bug bites, itchy skin, and rashes All Natural WOW DROPS is great for Hot Tea and Humidifiers during the cold &, flu season. In place of an aerosol freshener, for household use, add 10 drops in a water spray bottle. To eliminate odors in your car, simply add 10 drops in the outside air inlet vents at base of windshield. You'll be amazed! 0.32 oz. ORDER NOW! ORAL CARE: Wow Drops Breath Freshener, 0.32 oz. • Secure Denture Adhesive Cream Zinc-Free: Secure is the patented waterproof Denture Adhesive Cream that lasts longer! Won't wash away like most denture adhesives which are water-soluble. Secure® Denture Adhesive is waterproof, non water-soluble. Secure® Denture creates a long-lasting hold between your dentures and gums. It holds so effectively, it prevents slipping and sliding all day – up to 12 hours. Plus it's 100% Zinc Free and taste-free. No harmful residue to leak into your stomach. 1.4 oz. BUY NOW! Ingredients: Miglyol (derived from glycerin), Solution of Polyvinyl Acetate (non water-soluble ingredient used as the base of many chewing gums), Sodium Carboxymethylcellulose (derived from tree bark). • Secure Sensitive Denture Adhesive Cream Zinc-Free: Designed for denture wearers with sensitive gums. Same great 12-hour hold as Secure regular and same neutral taste. Plus it contains Aloe Vera and Myrrh. Fights the problems of gum irritation often caused by ill-fitting dentures. Efficiently reduces slip and slide, prevents dentures from rubbing against gums. Patented waterproof adhesive won't wash away when you are eating and drinking. Gives you extra comfort for your gums and extra hold to eat, drink, talk and smile with confidence. 1.4 oz. BUY NOW! Ingredients: Miglyol (derived fro glycerin), Solution of Polyvinyl Acetate (non-water-soluble ingredient used as the base of many chewing gums), Sodium Carboxymethylcellulose (derived from tree bark), Aloe Vera Gel, commiphora Myrrha Extract.Store at room temperature!. • Secure Denture Cleanser Anti-Bacterial Tablets Zinc-Free: Unique 4-Way Denture Cleaning Action: Anti-Bacterial Formula with Baking Soda > Cleans and refreshes dentures > Kills germs that cause odor and plaque > Removes stains. Secure Super Cleaning Tablets are specially formulated to clean all water insoluble residues from dentures that other cleansers may not remove. SECURE's powerful anti-bacterial formula kills germs that cause odor and plaque. The baking soda helps to remove stains leaving the denture clean and fresh. 32 ct. BUY NOW! Ingredients: Sodium Bicarbonate, Sodium Carbonate Peroxyhydrate, Trisodium Phosphate, Potassium Monopersulphate, Sulfamic Acid, Sodium Perborate Monohydrate, PVP, Sodium Lauryl Suphate, TAED, Aroma, Color C.I. 42090.. ORAL CARE: Secure Denture Adhesive Cream Zinc-Free, 1.4 oz. ORAL CARE: Secure SENSITIVE Denture Adhesive Cream Zinc-Free, 1.4 oz. ORAL CARE: Secure Denture Cleanser Tablets Zinc-Free, 32 ct.